Ernesto Diaz-Infante is a California based experimental/avant/free-improv guitarist who has released many solo and collaborative albums over the years. (Though noted as a guitarist he also released an album of solo piano pieces some years ago.). Look him up in the Aural Innovations alpha index and you’ll find lots of reviews. Though her name is new to me, Swedish-born guitarist/cellist Helena Espvall has played with numerous artists that many readers will be familiar with, including Espers, Vashti Bunyan, Damon and Naomi, Ghost and Marissa Nadler. She also performed at the 2006 Terrastock festival. 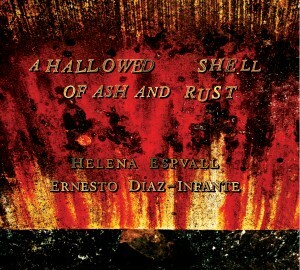 Ernesto and Helena’s first collaboration is titled A Hollowed Shell of Ash and Rust. In an email exchange Ernesto shared that the first feedback he received for the album described it as hauntingly beautiful, and I’d say that about nails it. There are 11 tracks on the album, three being 15 minute extended works and the rest in the 2-5 minute range. The three lengthier tracks are representative of the album as a whole. On Breathing Structures, guitar and cello combine to create a gradually developing ambient/soundscape/drone excursion. A major plus for me is that the instruments aren’t treated beyond recognition. You know these are string instruments, allowing for full appreciation of the sounds as I traveled down the wandering yet linear path they are leading us down. I’m a morning person and the first hours after I awake are when I’m at my most alert, yet also most relaxed. Looking at the clock it is 3:30am and the music has me in a meditative state, conjuring up images of an auditory canvas that guitar and cello are painting on as they glide slowly yet assuredly through space. Hollow Earth Theory is more on the experimental side, but still highly atmospheric. The music is simultaneously meditative and intense, creating an edgy, conflicting array of emotions. At times I imagined a lysergic string duo chamber music performance with a variety of trippy psychedelic effects. Ernesto and Helena playfully and creatively manipulate their instruments, but there’s also plenty of spacey, exploratory elements as well. Against a Realization in Weathered Iron is one of the more purely ambient pieces of the set, being complete, lulling serenity. I felt like I was in a cradle being gently rocked as I floated through a deliciously landscaped dream world. Among the highlights of the shorter tracks is the mesmerizing, avant-Indian infused psychedelia of With Space in the Spirit, with its shimmering and melodic cello, sitar-like drones and melodies, and percussive taps. Interiority is a dark and doomy yet serene chamber ensemble in space piece that I enjoyed. Bridges and Nothing features more sitar-like drones plus avant-garde soundscapes and effects. And Ringing Out Tomorrows consists of hypnotic drones, cosmic orchestral fervor, a strange melodic sense, and a variety of manipulations and percussive effects. In summary, Ernesto and Helena have created nearly 80 full minutes of beautiful string produced ambient/soundscape pieces. But this is far off the usual ambient/soundscape path. Though deep in space, the musicians haven’t suppressed their experimental interests, and I’d add for the benefit of those who typically steer away from avant-garde music that those elements serve to make A Hallowed Shell of Ash and Rust a far more interesting listen than the usual far too worn out path followed by the majority of ambient/soundscape works. Hauntingly beautiful indeed.